I often get asked about what I do for abs. I’m hourglass shaped and tend to hold most of my excess weight between the area beneath my navel to mid-thigh. So, my upper body and abs are the first to show the results of weight loss/strength training. If you are more apple-shaped/top heavy, then it will likely take more work for you to see results in the abs just like it takes me more time to results in my legs/glutes. With that caveat, here are the things that I do to get defined abs! 1. LOSE WEIGHT/FAT: Maybe you’ve heard the saying, “Abs are made in the kitchen, not the gym?” It’s true. 90% of getting defined/tight abs is losing weight/fat. You’re not going to see muscle covered by fat. If you do a lot of ab work, but still have a tummy/gut/Dunlap disease (your waist “dun lapped” over your belt … LOL! ), then it’s likely your six-pack is hiding under subcutaneous fat and losing weight will make them come out of hiding. Cardio is a necessity to burn calories and strength training helps boost base metabolism. High Intensity Interval Training (HIIT) is an effective way to burn calories and boost base metabolism! A simple 25-30 minute HIIT treadmill workout for beginners is: warm-up walk for 5 minutes; 1 minute sprint (fast as you can) followed by 1.5 min walk/jog, repeat 6-8 times, cool down walk for 5 minutes. I used this C25K week 1 treadmill workout as my time guide. 2. ABS OF STEEL by TAMILEE WEBB (VHS): I’ve used this tape for 20+ years. It has three 10 minute workouts and I’ll do it 3-5 days a week (abs don’t need rest/recovery every other day. 1-2 days of rest in a week is adequate). I recently found that the VHS I use can be found on sale on eBay (pink box/blue leotard) and you can download it to your computer at TamileeWebb.com! 3. BICYCLE EXERCISE FOR ABS: I just added in the last few months because my lower abs were not progressing in strength the way I wanted or had experienced in the past. I realized that this was likely because I wasn’t doing the Captain’s Chair lower leg lift exercise that I used to do 1-2 days a week when I worked out at a gym. I corroborated with some online research that this is one of the top three effective exercises for abs as proven by EMG testing (see article here). So, I started to think about buying a Captain’s Chair for my home gym. But then I looked at the #1 exercise (Captain’s Chair was #2) and discovered it was something that required NO equipment, can be done anywhere, and is the most effective for the total core (upper abs, lower abs, AND obliques). It was a no brainer. I started incorporating one to two 60 second sets (60 sec rest between sets) into my workouts 1-2 days a week. I saw my lower ab strength increase within a week or two and that resulted in improved performance during running and yoga (especially inversions). So yup! That’s what I do for defined abs. But again, remember number one is the most important!! Case in point, I’ve been doing Abs of Steel almost every day for the last several weeks, but barely doing cardio and still eating like I’m on the cruise! 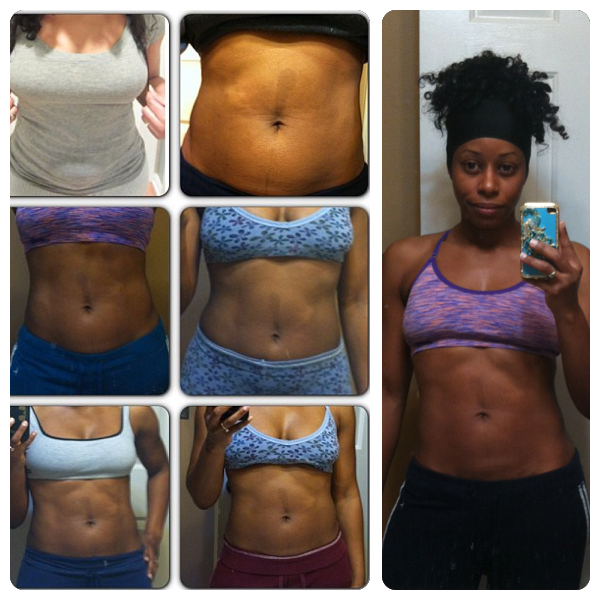 So … the abs aren’t looking like they did in December!! So, it’s definitely time to get the eating back in order and cardio back in effect for real! With that, time to get on the exercise gear and hit the basement for The Biggest Loser Cardio Max for Day 325 of 365 Days of Fitness (and Day 5 of 28 Days of Fitness). How do you get “six pack”/defined abs? Great info Shelli! I will be adding the bicycle to the end of my cardio workout. I also have Abs of Steel, Buns of Steel, and another of Tammi’s VHS tapes buried in my basement. I’m off to run and dig them out…..
Good info! It seems like we have similar body types by upper abs,obliques, and even the v cut developed quickly but my lower abs are trying to hide but they can’t hide from me lol…your abs look great I started following you late in your fitness journey and when I looked back at your older pictures I was like wow (not that you looked bad) just that you’re now so fit great job! Thanks for posting. You have inspired me to attempt my own 365 day workout challenge! 1. Plank holds (pulling the navel in tight and contracting those abs) for 45sec or more. 2. V-ups. These work especially well for those stubborn lower abs. Lie on your back with legs straight and arms straight above your head, lift legs and upper body (simultaneously )so that you are the shape of a V, arms moving towards your legs. Or you can hug your knees and then return back to the floor. That’s 1, do at least 10! 3. As already stated, CARDIO! Learn to love it! You can have rock hard abs hiding behind a 2 in. layer of fat! 🙂 nothing burns fat like a good run! 4. Push-ups at least 10. But building up everyday. Being sure to keep those abs contracted. NO GIRL PUSH-UPS! We’re WOMEN right! 😉 Do what you can, and push yourself! 5. Pull ups, as many as you can. Assistance is okay we’re working on our core not upper body strength! 6. Dips, at least 10, but keep that navel tight! 7. Leg lifts 3in off the floor for 30 secs. Then, immediately, while legs are still lifted open and close them (ankles together-ankles apart) for 30 sec. Repeat for 3 rounds. 9. Last but not least…a personal favorite, BURPEES! Try to do at least 10 after every cardio workout!! Essential Oil Mix for Hair Growth?